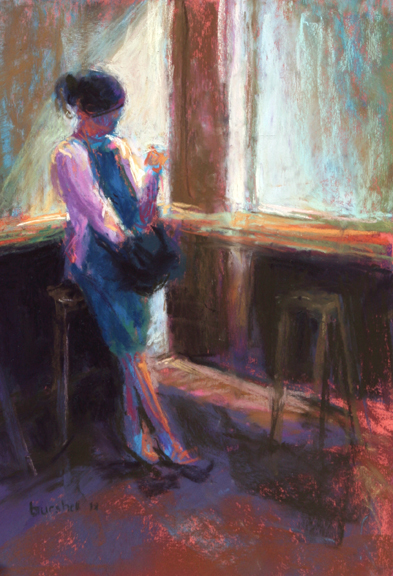 "WAITING" 10"x7" pastel on sanded pastel paper. "SHADOWS, Parador de Hondarribia, Spain" 17"x18.5" pastel on sanded pastel paper. 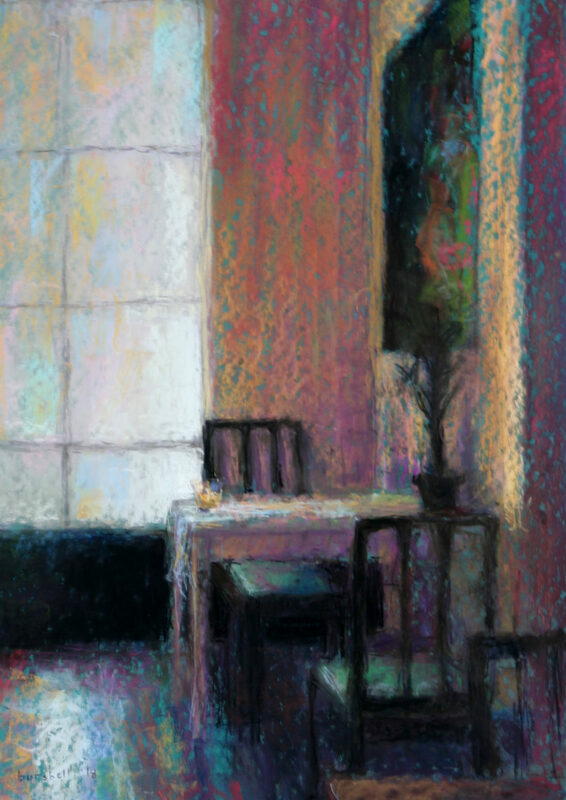 "WINDOW LIGHT, Lady Mendl's Tea Salon, NYC" 15 " x 9" pastel on sanded pastel paper. 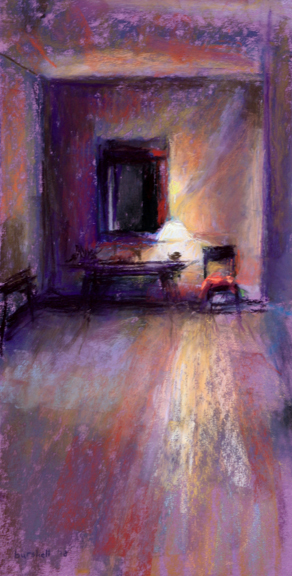 "Ephemeral Light"- pastel on sanded pastel paper. "Mist, Santorini"-pastel on sanded pastel paper. "Three Stools"-pastel on sanded pastel paper. surroundings – the same interior can have a magical aura of light that bathes it in warmth one moment and looks dull the next. Just as everyone views life from their own vantage point, everyone viewing my pastels sees a different picture and, thus, has a different interpretation. The interior seems so conceptually simple and yet it is dependent on humans building it and it maintains its form whether humans are in the room or not, but the light continuously changes. My pastels catch that one moment in time and memorializes that light and space. “An artist may begin his career more interested in the subject matter than in how he presents it. But as he grows in awareness the subject becomes less important to him than the beauty of color, light, atmosphere, and composition. With these elements he composes the more mysterious phases of painting….The art form has ennobled the subject matter” (Henry Hensche, The Art of Seeing and Painting, 73).